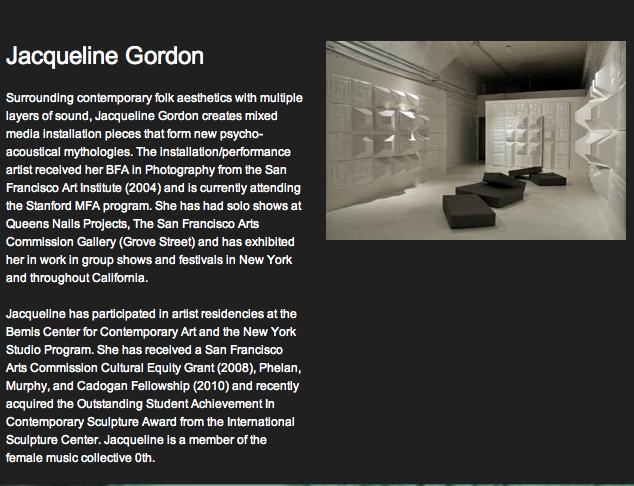 Sonami’s selected artist for the Spread exhibition was artist, Jacqueline Gordon. Yet another amazing artist that does incredible work exploring architecture and how sounds (whether from the outside coming into a designated space or synthesized sound) affects both the space and the listener. Hoping to see her featured on artist site, The Limner, soon. You can view her upcoming graduate show here. Posted in Conceptual, Digital Art, Multi Media, Performance and Conceptual, Sculpture and tagged as bay area, conceptual, conceptual art, conceptualism, experimental art, jacqueline gordon, postaday2011, San Francisco Art Institute, sound art, sound artist.